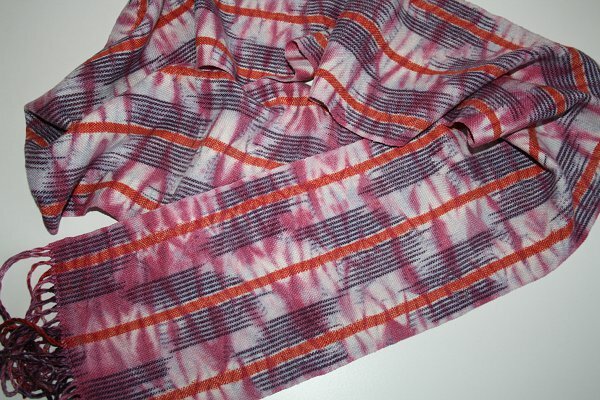 This ikat-ish project was last seen as a damp warp back in May. I wound the dried yarn into a cake, then wound the warp using the warping wheel with little excess loops of yarn where I tried to get each end to line up according to the plan. This went moderately well. My ties to resist dyeing weren’t exact distances apart, then there was some slippage and various inaccuracies in handling, not to mention yet another muddle in my calculations (I really need to learn to read the planning notes I make. Going by memory, I gaily changed from 25 to 20 to 24 epi, and ran out of yarn while warping. Nothing like necessity to encourage flexibility!). Given all that was going on I decided to hand stitch the shibori threads in the finished cloth rather than adding extra warp ends to do the gathering. 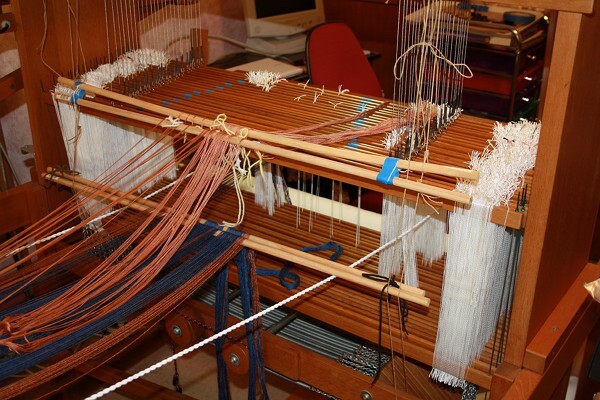 Here is the warp shown from the back of the loom. The edge areas are narrower than intended. It’s not a great photo but you might be able to see that overall arrangement is not too dissimilar to the sketched plan. The dark dashes kind of line up – viewing from a galloping horse in the dark may assist in seeing it. 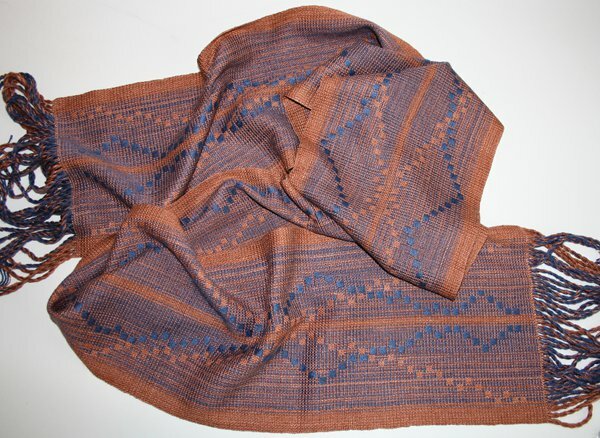 The actual weaving was straightforward – plain weave in undyed 20/2 silk. I had enough warp length to do a little extra to use in sampling the next steps. I did running stitch up each side of each red/orange stripe and gathered tightly, then dipped in a mix of yellow and brown dye and steamed. It’s ugly. So, so wrong. The colours don’t work. The values don’t work. The patterning is a mess. There is no particular definition or variation in the brown. 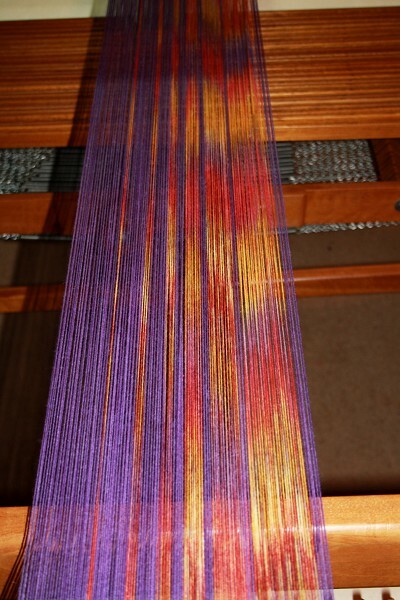 There are all the technical problems in winding the warp already mentioned, plus the previously dyed areas bled. 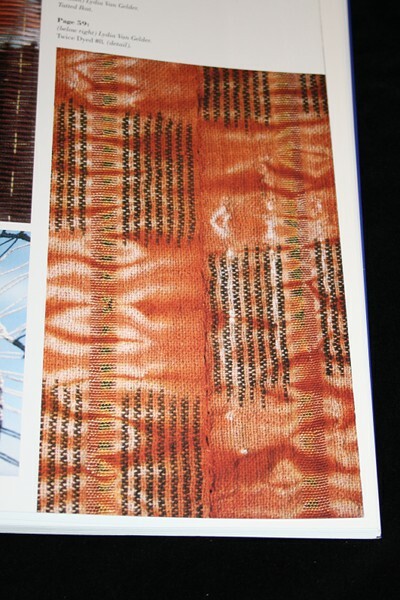 I based my efforts on a piece in Lydia Van Gelder’s Ikat II. I didn’t expect it to be the same of course – “slightly” different levels of expertise (! ), plus I was working from a photo and deliberately changed a few of the things I saw/understood, let alone the things I didn’t see/understand. I’ve included a shot from the book, which I think fits within fair use. I was careful to wash the actual scarf before gathering and redyeing – there was no sign of colour in the water. I used the same stitching. I had some ideas to try in the hopes of a better result. 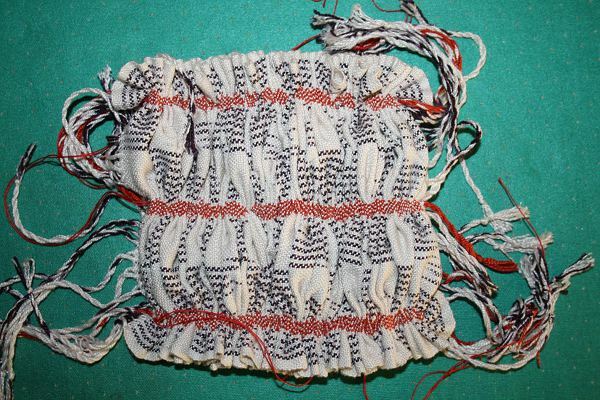 The photo shows the gathered cloth ready to be soaked and dyed. Then I dropped the ball. I put it to soak (a couple of hours is good), thinking I would have time for the dyeing later that day. Time passed – two weeks worth. This morning I finally brought myself to look at the sorry, soggy thing. The soak water was a pale blue. The dyes had clearly bled and run. In a spirit of “let’s just get this over” I went out to the garage, grabbed the bordeaux dye stock and applied it, undiluted, with a brush. I’ve been writing this up while I waited for it to steam. For me it very nearly works. All the dyeing errors are still there, but not so intrusive. The narrower range of colours helps. The stronger value of the overdye and its horizontal tendency gives some balance to the verticals. In person the fabric has a nice sheen, drapes well and is very soft and smooth to the touch. (I ended at 24 epi for the 20/2 silk plain weave). I don’t love it, but I expected to hate it. Visiting The White Rabbit Gallery, a collection of contemporary chinese art plus lunch at the Mission Restaurant under the Ng Gallery nearby, rounded off by a quick visit and some remnant-box-diving at Elsegood Fabrics (can’t find a working website, but come out of the restaurant, walk across the laneway and you’re there). I’m usually a bit wary of contemporary art (I like happy and beautiful, not so keen to spend leisure time with tortured, depressed or self/society-flagellating). The current exhibition here had lots of beautiful, including very interesting textile work, with intent and meaning but not dark-dark-dark. Nalda Searles drifting in my own land exhibition at Mosman Art Gallery. Really beautiful, thought provoking textile artworks. Nalda had come over from WA and gave a floor talk – to quote the website “revealing the imagery and processes that have informed the art practice and vision of one of Australia’s unique and evocative practitioners”. And they didn’t over-promise. Nalda spoke very directly and personally. Plus lots of people to natter with afterwards. The Sydney Craft & Quilt Fair – lots of inspiring work, talking (on the ATASDA stand and just running into people) and just a touch of shopping. Family lunch (my original nuclear family) at Ottomans for mum’s 83rd birthday, which was so nice I took Geoff and the boys (current nuclear family) there this week for Geoff’s 55th. Some clearing and re-arranging in my workroom-formerly-known-as-the-dining-room. The idea was to display as much as I could of previous work and larger samples (smaller odds and ends of sampling are in folders) – basically to remind me of possibilities and actually use the samples actively. 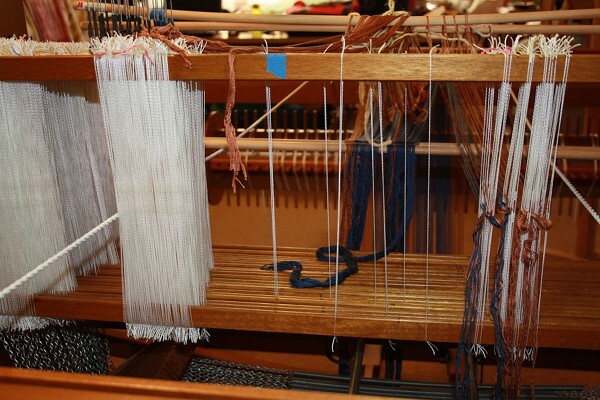 The photo shows the area behind the loom, with two of the five hangers. Mending socks – yes, there was enough to make this a separate item. I knit socks for all the family and with colder weather arriving there has been a mini-avalanche of holes to be darned and toes to be cut off and re-knit. Which may not sound much to some, but I really like lots of quiet time pottering around by myself and all of this in a couple of weeks is … phew. Last week’s ?? 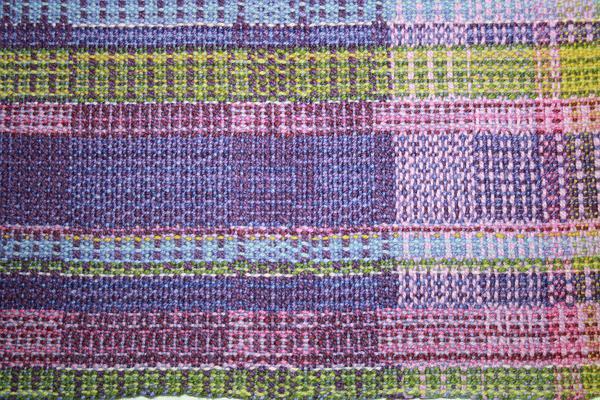 warp is now a not quite finished scarf (slightly damp, fringes to twist) and I’m very happy with the result. With such stretchy yarn I took the standard weight off the back beam tensioning lever (thingy – too lazy to look up the correct name) and used a much lighter fishing weight. 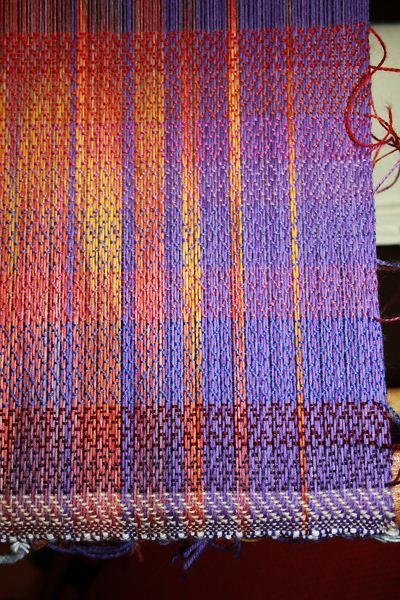 Using the avl warping wheel to get an ikat-ish effect in the warp worked well enough for me. There’s a lot of shifting around (I suspect I didn’t identify the repeat plus there was variability through the skein of hand-dyed yarn), but enough blocks of colour to give the desired result overall. After washing my sample of 9 potential wefts I was surprised by my final choice – “sweet pea”, which I would describe as a fuschia. 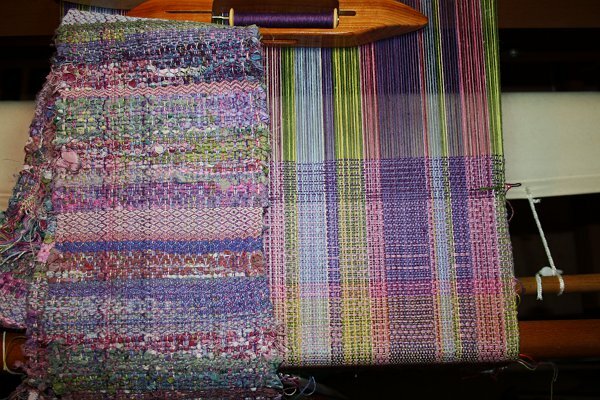 The purple which was my favourite on the loom drabbed down the shifting colour stripes and didn’t add anything to the purple stripes. The brighter colour gave a spark and warmth to both. The texture given by the twill also suits my taste. It’s more visible at a medium distance than I anticipated – I thought it would be a kind of extra as you got close – but I like that colour isn’t the whole thing. 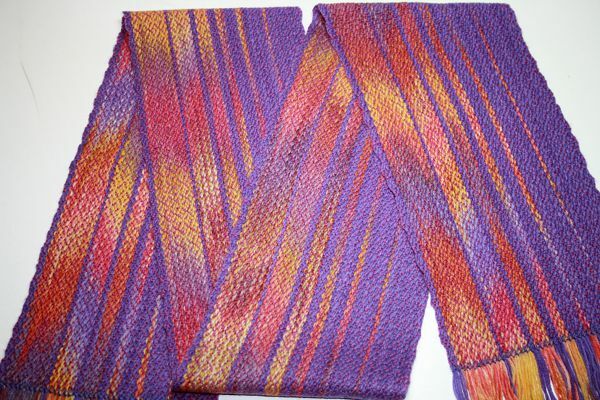 The twill also gives a wobbly edge to the stripes and the whole scarf, which appeals to me. Overall a good result, lots of lessons learnt and lots of leads for future exploration. On a related note, this week my copy of A Fiber Artist’s Guide to Color with Laura Bryant arrived. I’ve watched it all once and will be watching again. I always like reading and learning more about colour, and to have a weaver’s presentation is a real bonus. 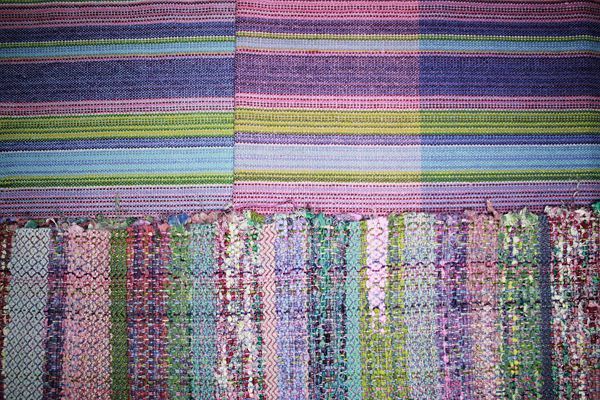 Her own work is amazing – complex double weave with very complex colour. Don’t jump to conclusions – so far all adjectives are appropriate for polite company. My husband’s was “pretty!” as he wandered past. It’s Araucanía Ranco Multy from Chile, 75% wool, 25% polyamide, around 344 m/100gm. 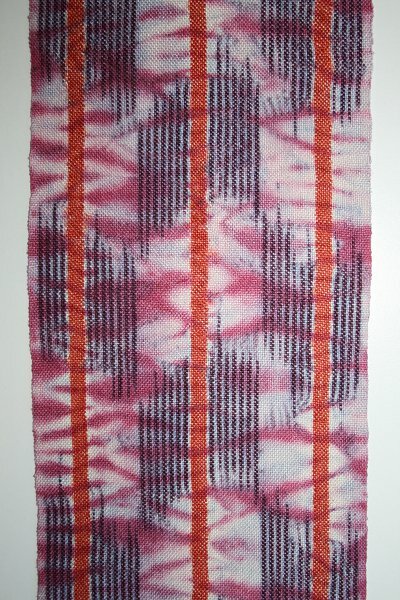 I wanted to try adapting Bonnie Tarses’s “almost ikat” technique to use the avl warping wheel. See Bonnie’s YouTube tutorial, and her blog. 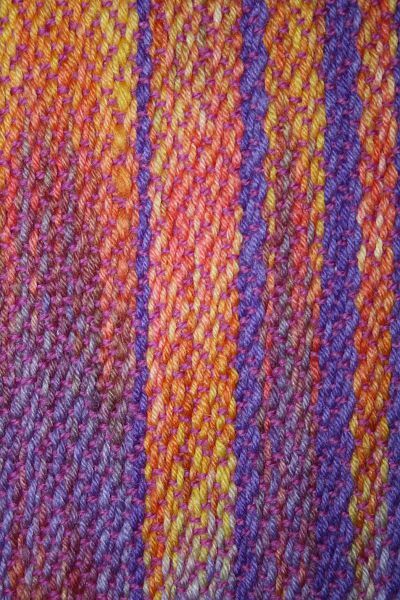 I combined the multi-coloured yarn in stripes with an almost-solid skein. 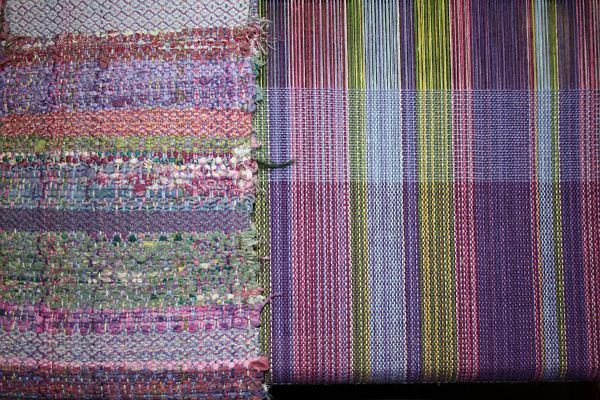 I’ve been reading Lydia Van Gelder’s Ikat II – a beautiful book with great projects to guide experimenting with ikat. I’d like to try incorporating some elements or loose interpretations in my work, and this seemed a good place to start. The yarn brings up another adjective – “bouncy”. It was sold as sock yarn and is spun quite soft and lofty. 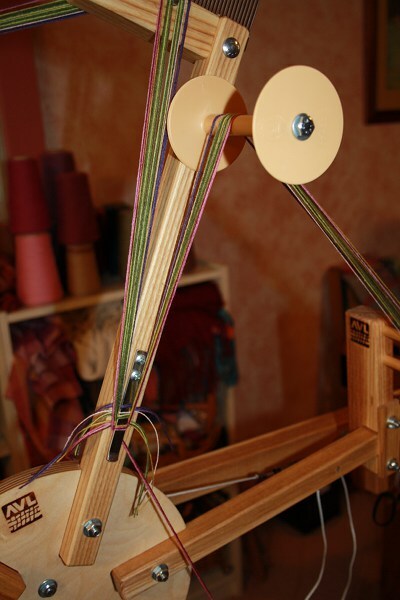 I did a couple of samples on my ashford table loom with no difficulties, but on my big noble floor loom it’s hard to get enough tension to form a shed without a lot of stretching. Plus I noticed a lot of fluff as I was threading and sleying, so I am dubious about “durable”, at least when used as a warp. “Puzzling” refers to weft selection. In the photo there are 9 different colours of wool weft (Bendigo Woollen Mills Classic 2 ply). 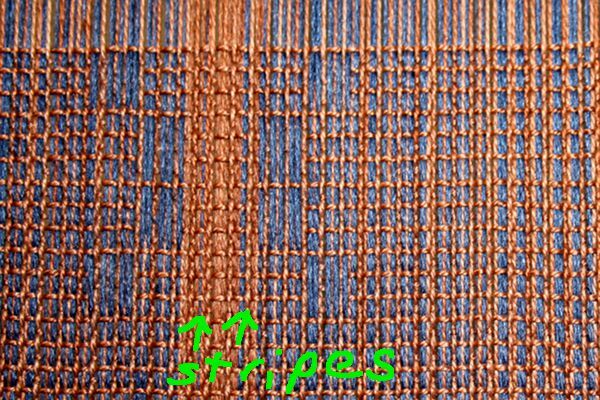 I want a slightly weft dominant fabric (trying to make the most of the shifting colour), in a twill (for drape). I like the idea of some secondary patterning, so I’m using herringbone twill threading and lift. (not exactly. It’s a straight 8 shaft twill with lifts that make it act like a 4 shaft herringbone threading). “Uncertain” relates to me – I don’t how much of the above is rubbish. Which brings us to “stalled”. I’ve run out of weekend, plus I want to cut off and wet finish this first little bit. I did sample earlier, but a bit too small, with different colours plus at 15 and 20 ends per inch rather than the 18 epi which I’m actually using (since my 12 dpi table loom reed is busy elsewhere). 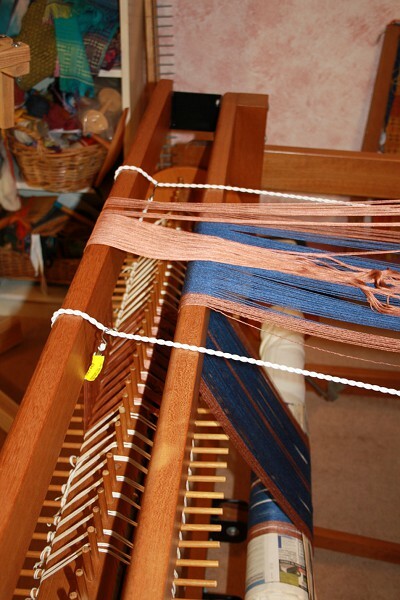 I got the warp on – all seemed to go well. Wove a few test centimetres to check threading. It looked OK, but somehow a bit streaky. The pattern definition wasn’t as good as in my samples. Perhaps it was the closer values of the foreground and background colours. 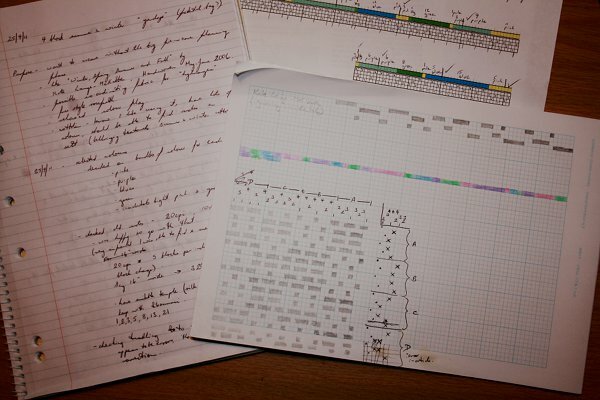 Obviously the sett had changed – the samples were 40 and 30 epi, with the new reed I had changed to 36 epi. The photo shows where I stopped, while partway through hemstitching. Clicking will get the larger version, and I’ve arrowed the two single blue ends which outline the edges at the pattern reversal. The one one the right shows clearly. The one on the left is almost completely obscured. Plus there’s a general streaky and lumpy effect going on. 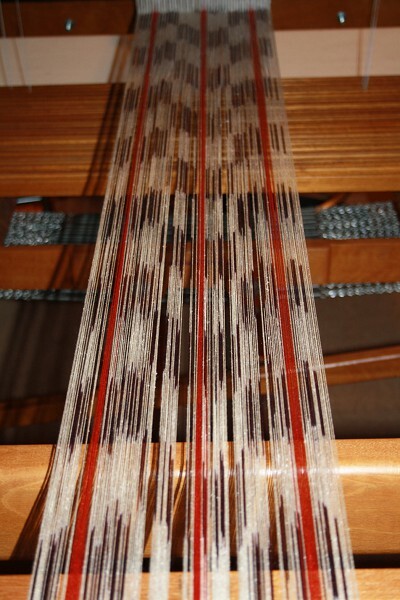 I’m using a 12 dent per inch reed and each of my warps (ground and supplementary) is 18 ends per inch. The ground is plain weave on shafts 1 and 2. The supplementary is on shafts 3 to 15, but in the area arrowed they are all on shaft 3. All the supplementary ends lift with shaft 1, unless they are involved in one of the float areas. Sometimes figuring things out in weaving does my head in, and after stomping around the house a while I decided to post about it – partly for advice, partly because just sorting out the question can help find answers (I tend to see this blog as my work diary, which happens to be public and occasionally of interest to others – though I’d be surprised if anyone gets this far!). The incomprehensible sketch (playing with yet another new toy, a wacom bamboo tablet) helped me see the problem. The ground warp is 18 epi in a 12 dent reed, so 2 ends in one dent, 1 in the next etc. 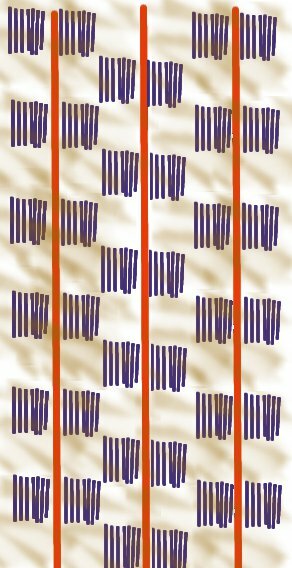 The supplementary warp is 18 epi, so 2 ends in one dent, 1 in the next. The way I’d done the two warps I ended with a total of 4 ends in one dent, 2 in the next. So there’s some lumpiness! So I could redent to even it out with 3 ends per dent – 2 ground + 1 supplementary in one dent, 1 ground + 2 supplementary in the next. I suspect this will help, but not solve my problem. The threading has ground ends alternating with supplementary ends – eg 1 3 2 3 1 3 2 3 1 3 2 3 (1 and 2 ground, 3 supplementary). That is, the supplementary ends sit either side of the ends on shaft 1, rise and fall with it, and are sometimes dented with it. So I think it’s in the nature of things that they won’t necessarily sit nicely side by side. The current craming isn’t helping. 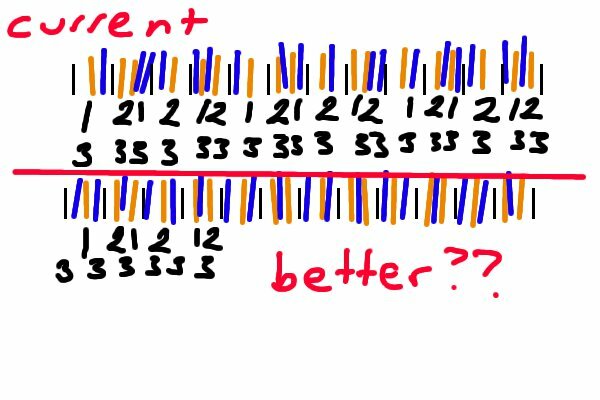 If I had an 18 epi reed I could dent: 1 in one dent, 3-2-3 in the next etc, and overall maintain my 18 epi per warp (the ground warp 1 end per dent, the supplementary 2 ends every second dent). But I don’t. And I’m now in frugal mode (all those new toys to pay for), even if such a fine reed is available and such spacing didn’t give me warp abrasion problems. On the home front, there’s nothing going on with the supplementary warp project – the new reed is still on its way, the new warp is still damp. While waiting I’ve been doing some dabbling. First up was braiding or kumihimo, using a beginner’s marudai I got secondhand from the guild shop. I’m happily improvising the rest of the equipment while I try out this craft. 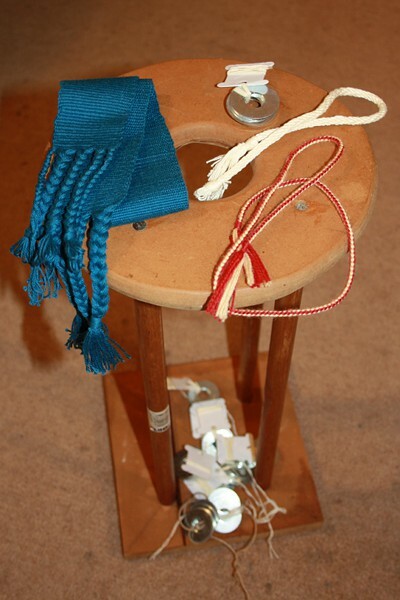 Photo shows marudai (the stand that holds the braid while you are working), the improvised tama (weighted bobbins) and my first two braids. For more photos and info see wikipedia. The teal warp-faced weave is my backstrap attempt. 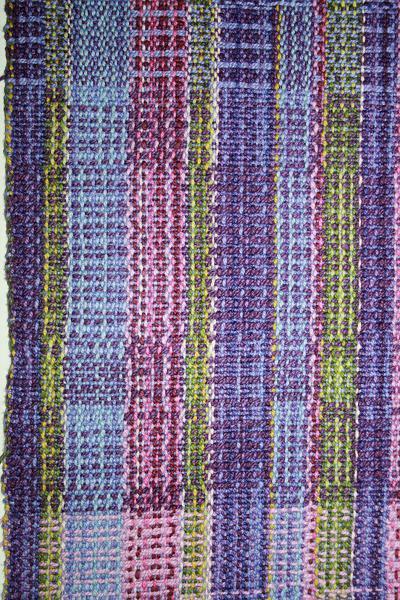 I’ve also been played with backstrap weaving, following Laverne Waddington‘s brilliant instructions. So far I’m only partway through step one – backstrap basics on WeaveZine, but at least I have the satisfaction that despite significant tension issues the second half of my first weaving was much better than the first (which does set the bar very low indeed!). Yesterday I wound the dry silk/merino supplementary warp, using the AVL warping wheel and chaining off the sections so I could put it on the second back beam. The winding went well, the beaming got ugly at times – but it’s done. 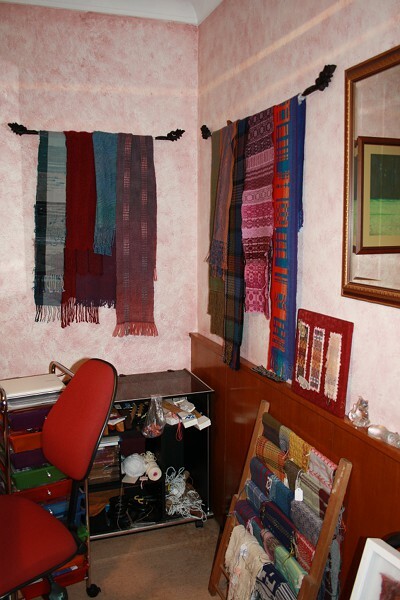 The photo on the left shows the two warps, the silk for the ground cloth on the sectional beam, the silk/merino on the plain warp beam which is a bit lower. I’ve only used the second beam once before, for the deflected double weave scarf, when I made a total hash of it – hopefully this will weave up more easily. I’m currently threading and so far it is going better than I expected. I’ve put the two warps on separate lease sticks, one set hung high, one low behind the heddles. 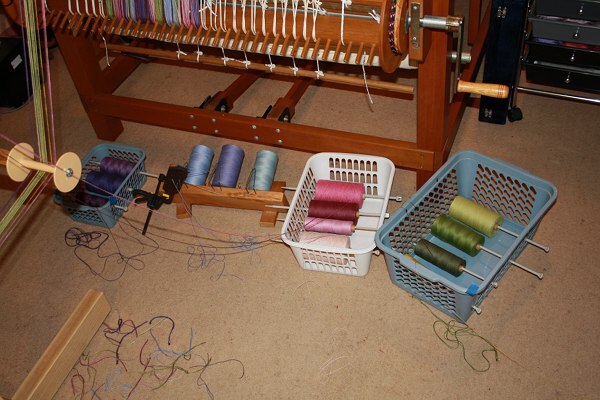 Working from the front, it is not too bad to reach both warps and select the alternating ends I need. With recent projects I’ve become much more careful of counting out the heddles I’ll need, moving un-needed ones out of the way, and pulling out sets of threads and heddles to work with. It seems to keep me more accurate, giving additional check points along the way. Just hope writing this doesn’t jinx me!